Getting an entry-level teaching job at an accredited law school isn’t an easy task—only about 110 of the more than 1,000 applicants each year succeed. But the Law School is beating the odds. According to the recent Entry Level Hiring Report by Professor Lawrence Solum of University of Illinois College of Law, 12 job-seekers with NYU J.D.s found teaching spots in 2006—representing the fourth highest placement number among all law schools. An additional nine candidates with NYU graduate law degrees, fellowships or acting assistant professorships were hired as well. New hires found positions at schools such as Cardozo School of Law (Margaret Lemos ’01), NYU School of Law (Florencia Marotta-Wurgler ’01), USC Law School (Shmuel Leshem (LL. M. ’02, J.S.D. 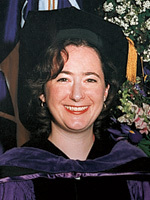 ’05)) and Vanderbilt University Law School (Terry Maroney ’98, above). “You can’t enter the market without years of preparation to make yourself a viable candidate,” says Sam Buell ’92, a former special attorney for the Department of Justice’s Enron Task Force, who contacted the ACP after deciding to pursue a career in teaching. “I’d liken the legal market for teaching to the NFL draft, or qualifying for the PGA Tour.” With the help of the ACP training, Buell made the cut. This fall, he will teach Securities Regulation and Criminal Law at Washington University School of Law.